Debt Collectors Threaten Consumers | The Consumer Law Group, P.C. You may have received one of these calls yourself. You are past due on a credit card bill or a medical account and your debt is sold to a debt collection agency, who calls you in an attempt to collect on the debt. Unfortunately, many people report that these phone calls are not just a friendly warning, but can be downright threatening. We explain your rights in this situation here. 27 percent felt threatened by the behavior of the person contacting them. 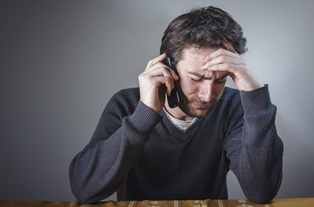 75 percent reported that a debt collector did not cease contact after being requested to do so. 53 percent reported that the debt collector had the wrong amount of the debt, that the debt was not owed at all, or that the collector had the wrong person’s contact information. 36 percent claimed that they were contacted at an inconvenient time—generally between the hours of 9 p.m. and 8 a.m.
37 percent reported being contacted four or more times over a one-week period. 15 percent of respondents reported that they had been sued by a debt collector in the last year. All of these interactions are uncomfortable at best, and illegal at worst. As a consumer, you have the right to not be harassed by debt collectors. Understanding these rights can help you protect yourself in the future. Failing to cease communication upon request. Communicating with consumers after they have filed bankruptcy. Communicating with consumer represented by an attorney. Communicating with consumers after a request for validation. If you are dealing with a debt collector who has broken these regulations, keep a record of violations and contact our consumer attorneys through the link on this page. We will let you know if we are able to help you end the harassment.